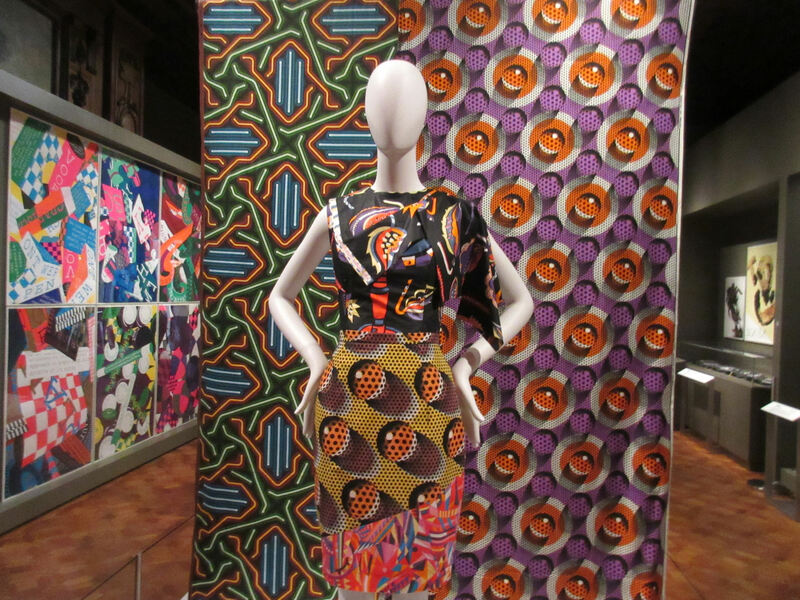 2016 NYC Photos #16: The Museum of Intelligent Designs « Midlife Crisis Crossover! 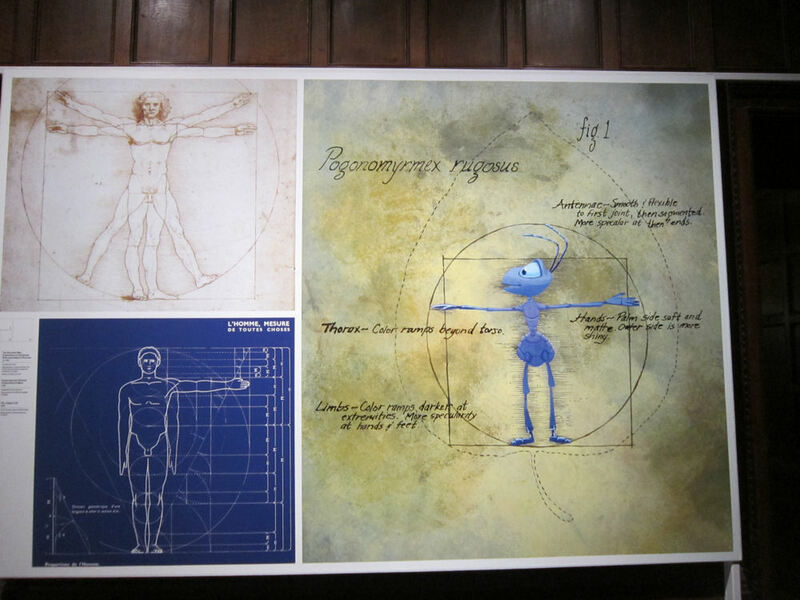 Do we have enough fans of either da Vinci or A Bug’s Life to appreciate Vitruvian Flik? Here’s hoping. After our tour of the USS Intrepid and its aircraft and spacecraft collections, our next ambitious stops were a bit farther away, up into the mannered nether reaches of Manhattan’s Upper East Side. I’d pegged a couple of Museum Mile mainstays whose current exhibits might be in our aesthetic wheelhouses. Getting anywhere near them was half the battle. On Day Three we’d tried something we hadn’t done on our previous Manhattan trip: a ride on an actual New York City bus. In 2011 we’d done fine using New Jersey’s NJ Transit line for shuttling back and forth between our Weehawken hotel and the Port Authority, but I left NYC’s MTA buses off the table as a transportation option, if only because it seemed as though the subways got everywhere we wanted to be. The long, long walk to the UN Building taught us otherwise, not to mention the considerable distance between the Metropolitan Museum of Art and the nearest stations. After that day’s longer, much longer walk through Central Park, the bus provided invaluable assistance in hauling our exhausted carcasses from the Met to the 5th Avenue/53rd Street station, from which the E train carried us west to our hotel at the finish line. The positive results of that initial test emboldened me to attempt a bus trip from the Intrepid‘s Hudson River dock to the Upper East Side. If you check a map, you’ll note they’re not close together. All the more glorious it would be, then, if we succeeded without excess walking or obstacles. In that sense, we didn’t succeed. Neither the MTA’s official app nor Google Maps warned me that our bus driver would pick us up across the street from the Intrepid, hit the next two stops per routine, then announce “LAST STOP” and kick us all off near the Hearst Tower. If you check a map, you’ll note that’s also not an Upper East Side fixture. 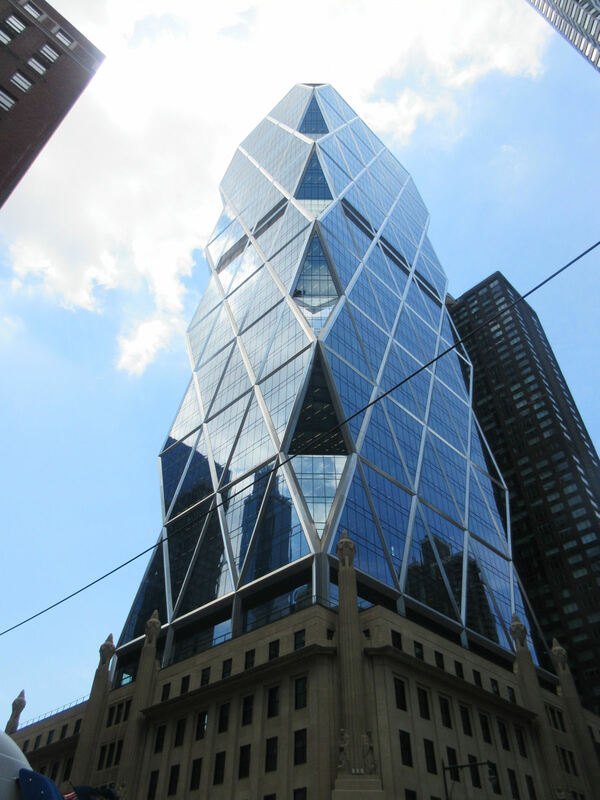 The stone base dates back to 1928; the wibbly-wobbly glass skyscraper was stacked on top of it circa 2006. If you’re a fan of A&E or women’s magazines, maybe go check out its corporate residents. Determined to ignore this setback, we killed a few minutes in the CVS across the corner, window-shopping their selection of foot pain medications, because that’s the kind of behind-the-scenes travel experience we think You, The Viewers at Home, can really appreciate. Other blogs may avoid the realities and discomforts and quotidian tasks that are part of the process, and that’s why they’re more popular. But are they keeping it real? Thankfully the magic of Google Maps found us a bus stop on the other side of 57th. Unfortunately it was also in the middle of Manhattan construction. We could see buses trying to approach from far away, zillions of minutes before they might actually arrive. Eons passed, one reached us, and we were on our way east. Slowly. Veeeery slowly. We disembarked at 57th and Park Avenue, smack in the middle of what I’m guessing is Midtown’s poshest area. By this time we were dying for lunch, preferably a budget-minded meal because we were allocating resources for a special dinner later. I tried searching for nearby fast food. Google Maps just laughed at me. Thankfully we found another food cart at just the right time. My wife and I bought one order of chicken on basmati rice and one lamb/chicken pita, then had ourselves a relaxing, impromptu picnic lunch sitting in Park Avenue’s grassy median, not really caring if drivers on either side stared or scoffed. One more bus ride was needed to reach our next destination. This juncture is where I learned another important lesson about NYC buses: most of the stops listed on every bus stop sign are imaginary. Or something. All I know is those signs had many stops listed and our next bus skipped nearly all of them. Even Google Maps was like, “Remember that time I had you wandering New Orleans for hours in extreme heat and every other stop was out of business? Yeah, this is worse. Surprise!” So the bus overshot where we wanted to go by several blocks, which we could’ve handled a bit better if my son hadn’t refused all the food cart’s meal options. 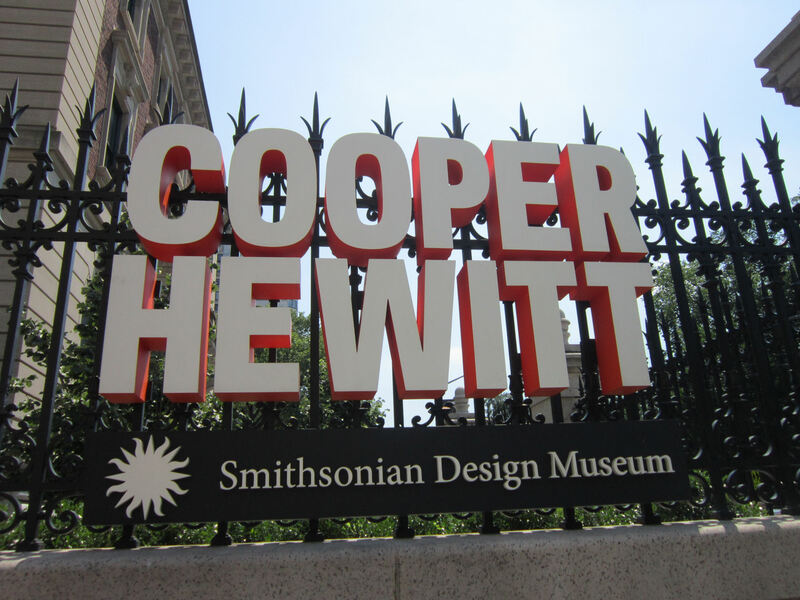 More walking got us there at last: the Cooper Hewitt, Smithsonian Design Museum. Part of the fabled chain that includes most of the museums in Washington, DC, they’re a specialized art museum focusing on the role of design in multiple aspects of art and life, encouraging deeper ruminations into the shapes, colors, contrasts, modes, styles, movements, and other criteria that humans choose in their creative endeavors. The museum was founded in 1896. I can only imagine how many iterations their logo has gone through since then. Its original incarnation as a Museum for the Arts of Decoration was housed at the Cooper Institute down in the East Village. 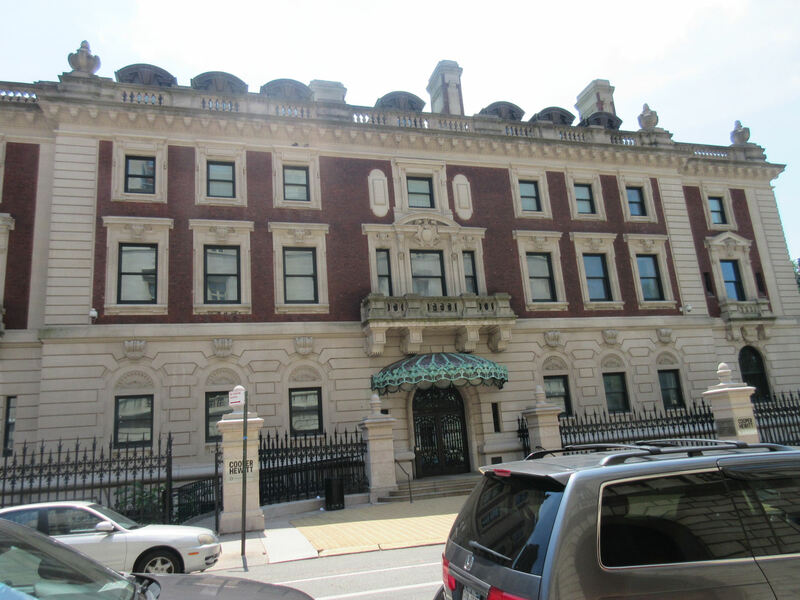 Its home since 1976 has been the Andrew Carnegie Mansion, which was built in 1903 as the home for the eponymous multimillionaire steel magnate/philanthropist, whose corporation donated the Mansion to the Smithsonian decades after his death. At first we mistook it for some eastern European embassy. In New York, you just never know. Our reason for coming: animation! 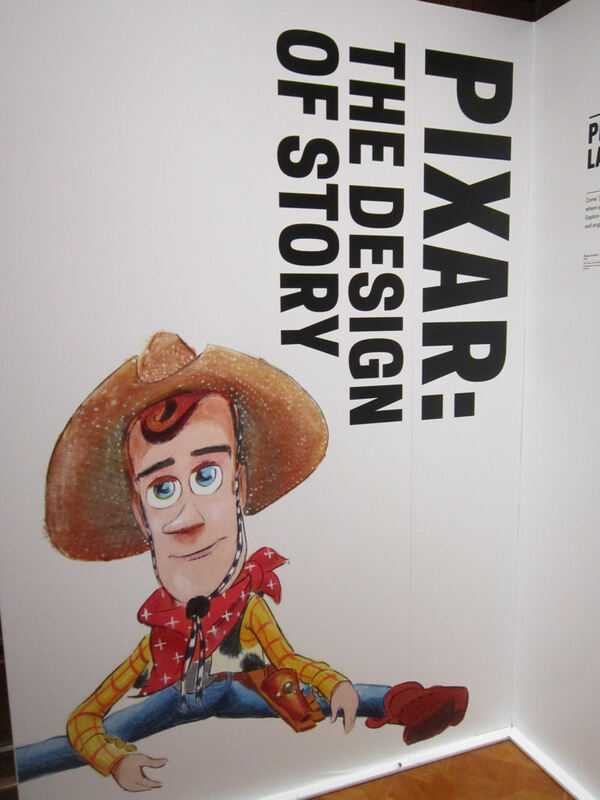 Specifically a limited-time exhibit called “Pixar: The Design of Story”, largely a collection of concept art for their earlier works. Before you rush to buy tickets, please note the exhibit’s last day was September 11th. Sorry, kids. 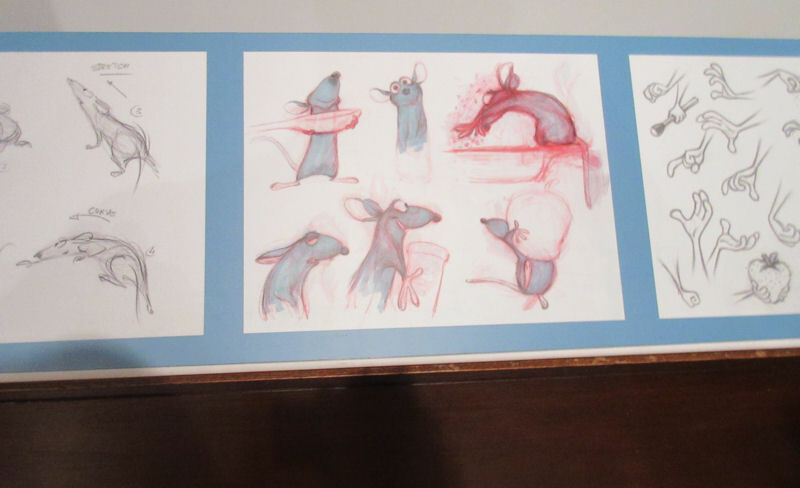 Remy concept art from Ratatouille was among the numerous physical pieces brought in from the Pixar archives. 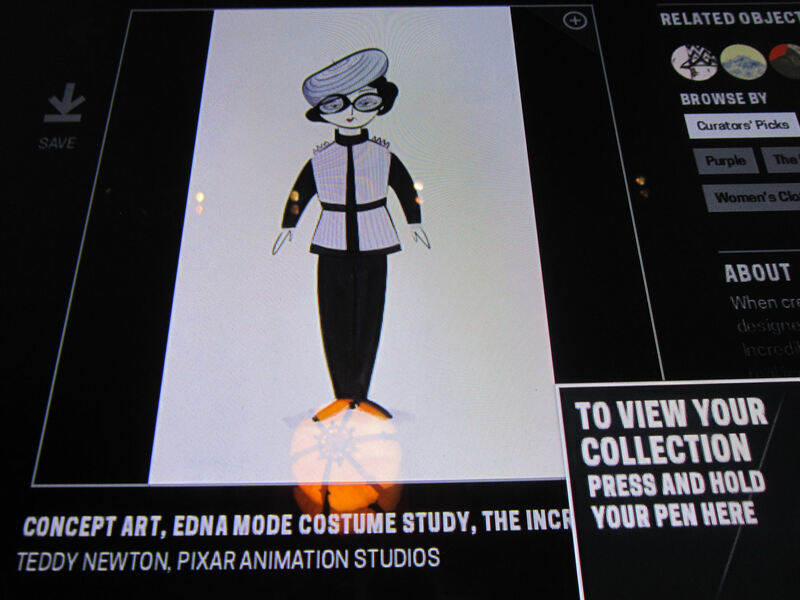 A larger virtual collection was viewable via fancy giant computer tables that required foot-long interactive pens to scroll through, select favorites, and experiment with digital art. Losing yourself in the available tabletop PC activities wasn’t hard for us guys. 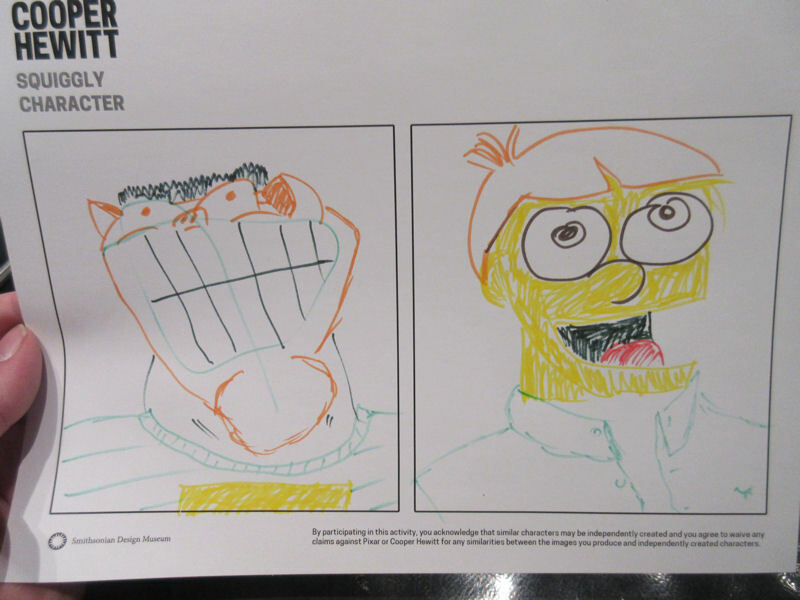 Alternatively, hands-on art stations let old-fashioned artists draw with markers to their hearts’ content. 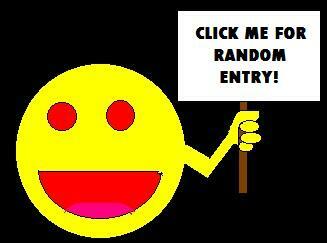 In this particular exercise, you were supposed to draw a random squiggle, then turn it into a less abstract work. I give myself a C-plus. I’ve done better. 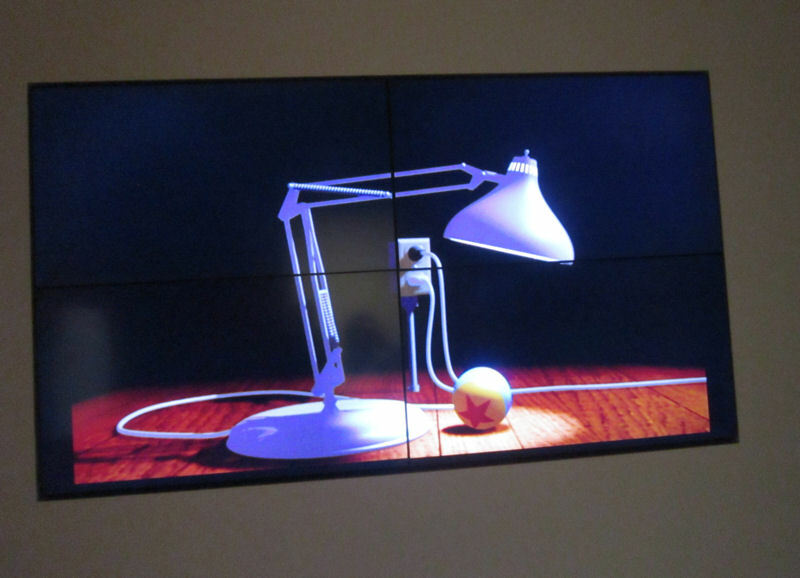 Or you could settle for watching actual animation starring Luxo, Pixar’s answer to Oswald the Rabbit. Other exhibits filled the various rooms and levels of the Cooper Hewitt, to tangents with our own predilections of various lesser degrees. We poked around here and there to make more of our admission fees. We also bought a panini at their small basement cafe so my son wouldn’t die of starvation then and there. 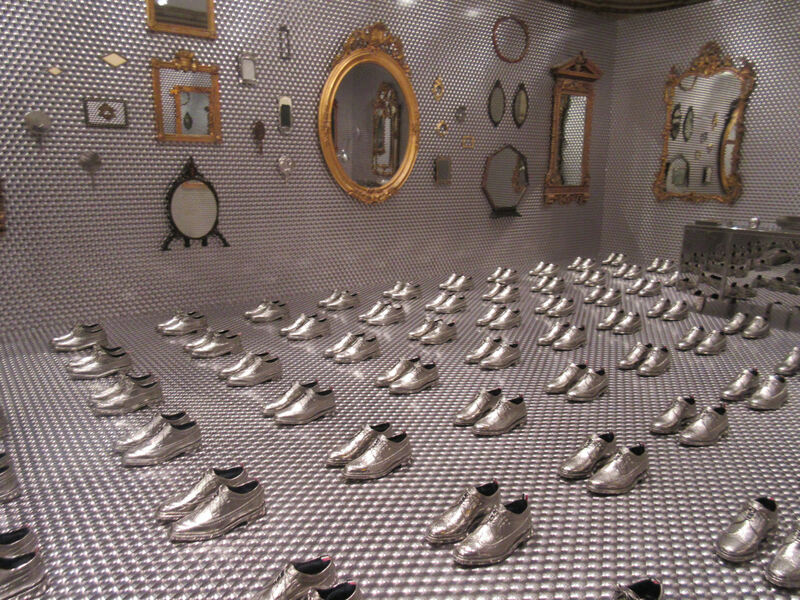 The most crowded-around installation was titled “Clock Prototype, A Million Times, 288 H”, a 2013 work of wonder by a Swedish collective calling themselves “Humans since 1982”. 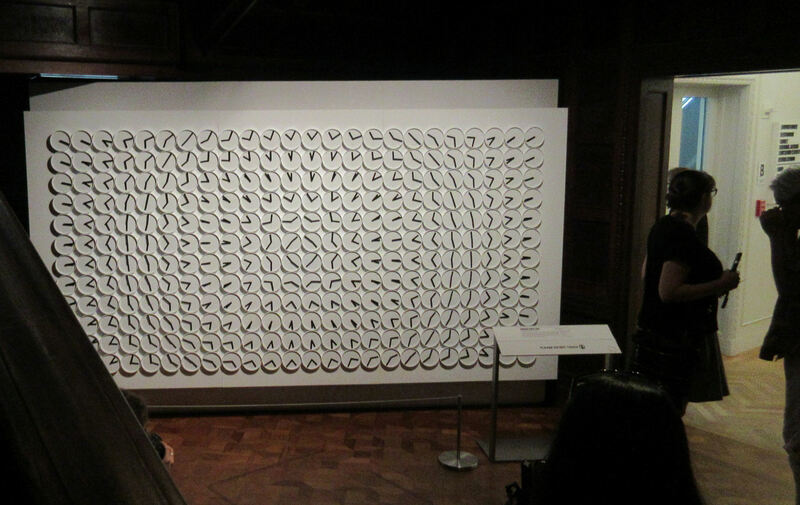 The clock hands rotate in intricately synchronized patterns to which no still photos can do justice. Someone else’s YouTube video gives a better idea of what these 288 clocks can do. For those who love fashion, here some is. I couldn’t tell you a thing about it because fashion blogging is light years outside my jurisdiction. But I know eye-catching when I see it.